Steeped in the tradition of the most respected and sophisticated Sufis and musicians since the Early Ottoman times, today the Galata Mevlevi Ensemble is considered the best of its kind. Continuously, young musicians and dancers join the brotherhood of the “whirling derwishes” under the spiritual and artistic leadership of Sheik Nail Kesova. In 1994 he had received personal permission by the 21st grandson of the founder of the religious order to hold own ceremonies according to the Mevlevi traditions and thus, to act as Sheik. The Galata Mevlevi Ensemble brings on stage the beauty and spirituality of the Sema, the Mevlevi whirling ritual accompanied by the traditional Mevlevi music: “Like a grain of dust which revolves around the sun” – through their religious dancing ritual, the dervishes leave the earth, revolve around God and merge with the truth. The dervishes whirl from right to left to their own heart and thereby embrace humanity and all creation. At the end they return as humans, more mature and in greater spiritual perfection. Already the founder of the brotherhood, Mevlana Celaleddin-i Rumi, was an extraordinary musician, playing the lute “rebab”, although his most loved instrument had been the flute “ney”. He developed complex liturgical music that was performed by his followers on special occasions for moral and spiritual pleasure. In the monasteries of the brotherhood, especially in the Istanbul Tekke in the neighbourhood of Galata, the most advanced musicians were trained and educated until the 20th century. Today it is Sheik Nail Kesova who composes liturgical pieces for the group. 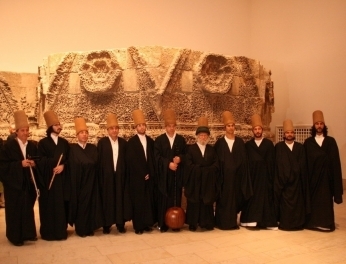 In 2008, the Sema ceremonies of the Mevlevi were inscribed by the UNESCO on the Representative List of the Intangible Cultural Heritage of Humanity.